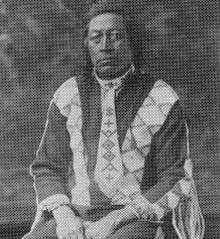 Ahtahkakoop (1816–1896) was a Chief of the House Cree, division of the Plains Cree, who led his people through the difficult transition from hunter and warrior to farmer and from traditional indigenous spiritualism to Christianity. Ahtahkakoop was born in the Saskatchewan River country. He rose to be a respected and tactical leader of the Cree Nation in the latter part of the 19th century. At the onset of his leadership, the plains buffalo herds were more than abundant in the northern plains and parklands, providing the mainstay of social and economic balance so vital to the survival of its people. By the 1860s, the buffalo were rapidly disappearing and the arrival of the European settlers would irrevocably alter this delicate balance, forcing Chief Ahtahkakoop to seek alternate means of survival for his own. Together with his cousin, Big Child, he signed the 1876 Treaty 6 as the second signatory chief at Fort Carlton, Saskatchewan, where he agreed to relocate his band to a 67 square miles reserve at Sandy Lake, 45 miles northwest of present-day Prince Albert, Saskatchewan. Ahtahkakoop and his people remained neutral during the uprising of 1885, determined to honor the treaty signed nine years earlier. He died 1896 at the age of 81 years, and was buried on the reserve that was named after him.